In Italian, la dolce vita means the sweet life so it seems fitting that Italians eat cookies at breakfast, lunch, and dinner. 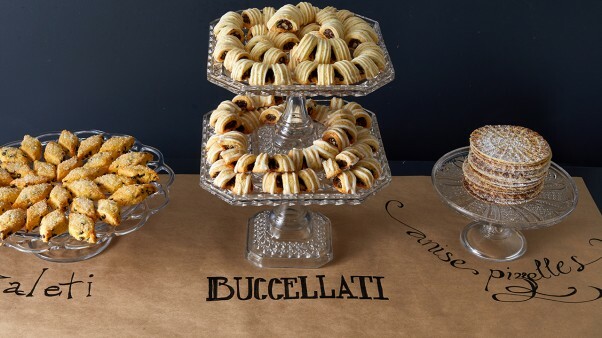 On today’s show, Martha shares three scrumptious recipes including Sicilian buccellati cookies filled with a delicious combination of pecans, figs, and raisins, Italian wafer cookies known as pizzelle, and the distinctive diamond-shaped zaleti found throughout Venice. You’ll definitely want to add these to your repertoire! Make Martha Stewart's Anise Pizzelle from the Classic Italian Cookies episode of Martha Bakes. Transfer batter to a piping bag fitted with a 1/2-inch round tip. Pipe about 2 tablespoons batter in a circle around the center of each pattern on the heated pizzelle iron. Close and seal with clasp. Cook until golden brown, about 45 seconds. Using a small spatula, release and remove cookie. Using kitchen shears or a 4 1/2-inch ring mold, trim any ragged edges, if desired. Transfer cookie to a wire rack to cool. Repeat with remaining batter. Dust cooled cookies with confectioners’ sugar, if desired.